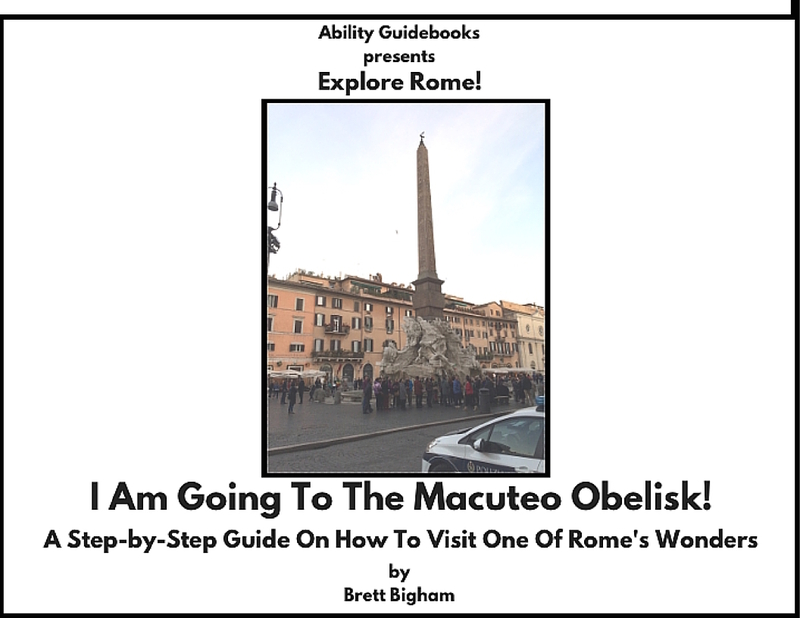 Explore Rome and Visit the Macuteo Obelisk! A New Ability Guidebook! It is always fun when I get a new Ability Guidebook finished! I am inspired because I have had a volunteer step forward to translate the books into Italian! You cannot Imagine how exciting it was to get that email! I am writing these books for Italy knowing that only a few English speaking tourists might ever need them. But I knew that once the books were in English, if I could find someone to translate, they could then be a valuable tool for people with autism who live in, or who are visiting Rome. My hope is that I will inspire some people in Italy to step forward and make some books of their own! Even now my friend Bill Pierce is visiting Vienna taking pictures to create some additional Ability Guidebooks. 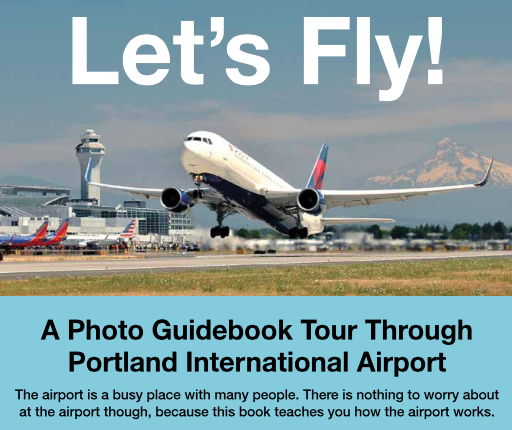 Some of Sam Sennott’s students at Portland State University chose to make a book instead of doing a final paper. These are more awesome people stepping up to help create a permanant library of supports for people with autism! (And a support for teachers who are taking their younger students on field trips to these important cultural destinations). I am thrilled to have Bill join me in this project and the students of PSU as well! If anyone has decent pictures of the Vatican Museum entry I sure could use them….mine turned out pretty poorly. Author Brett BighamPosted on June 9, 2016 November 17, 2017 Categories Ability GuidebookTags Ability Guidebook, autismo, brett bigham, italy, Macuteo Obelisk, oregon, rome, teacher of the year, touristLeave a comment on Explore Rome and Visit the Macuteo Obelisk! A New Ability Guidebook! An Ability Guidebook for Rome! I Am Going To The Minerveo Obelisk! This is a very simple Guidebook on how to visit the Minerveo Obelisk near the Pantheon in Rome. Most tourists would visit the Pantheon and then wander by the Piazza della Minerva to see Bernini’s elephant with the ancient Egyptian Minerveo Obelisk mounted on top. For our tourists with autism (or Italian kids on a field trip) they might need a more simple outing for the first attempt. The trip to see the Pantheon and the trip to see the Minerveo Obelisk are the same. The obelisk, however, can be seen without entering a building and without too much difficulty. The visit can be done in a taxi to simplify it even more if the need be. If the visit to the Minerveo goes well, the next visit could be to the Macuteo Obelisk or to the Pantheon itself. Once the stress of the trip is out of the way, each additional trip becomes easier and easier. 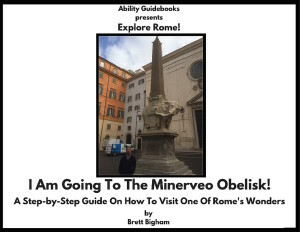 Ability Guidebook_ I Am Going To The Minerveo Obelisk! Author Brett BighamPosted on May 8, 2016 November 17, 2017 Categories Ability GuidebookTags Ability Guidebook, autism, autismo, brett bigham, italy, Minerveo Obelisk, oregon, rome, teacher of the yearLeave a comment on An Ability Guidebook for Rome! I Am Going To The Minerveo Obelisk! 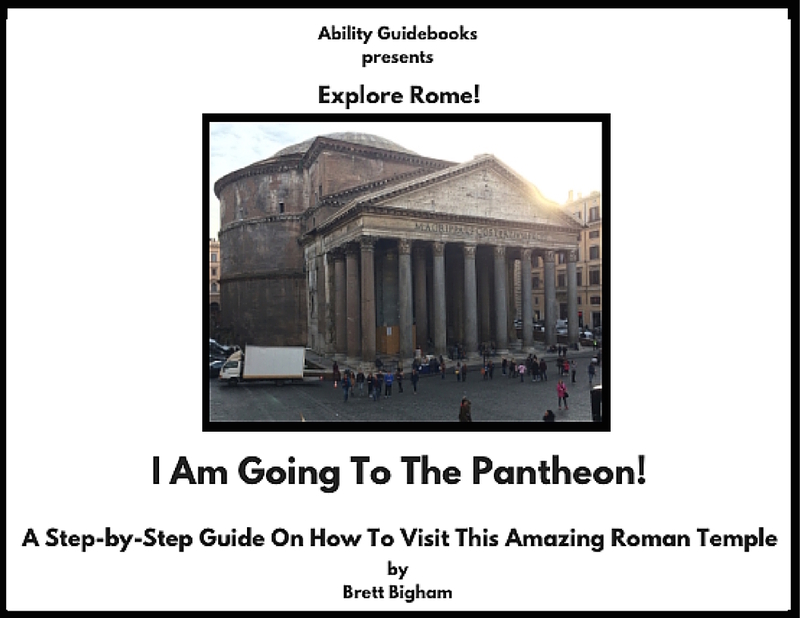 “I Am Going To The Pantheon!” A new Ability Guidebook for peeps with autism. I am hoping to complete quite a few books from my trip to Italy. In the making I have books on the Arch of Constantine, The Roman Forum, The Vatican Museum and more! It is my hope that people who speak other languages will step up and translate some of the books into their own language. This book, for instance, may be of great assistance to an English speaker with autism who is visiting the Pantheon. I know that only a handful of people might need such a support. But I am more than happy to make this for a handful of people. In my classroom I was making these for one person in particular at first. I saw how much it changed their world and so I am willing to keep creating the books in the hopes that it will open up someone’s world. I want there to be a tourist, somewhere, who needs this book. But, honestly, what I am truly hoping to do is inspire others. I’m hoping and Italian speaker will see this and translate it. THEN we have a whole different audience. In Italian this book becomes and opportunity for every person with autism in Italy. This book might mean the difference of some kid who is neuro-diverse getting to go on a field trip with the rest of his class. In Italian, this book can be a tool for every kindergarten or first grade teacher taking their class to the Pantheon. And then if we ad German and Dutch, French and maybe Hungarian, then we are opening up a world. And those translators might be enlightened and encouraged to create their own books for their own city’s. My friend Florian from Passau is translating some now into German. Mike has translated several into Spanish. There are now books for Oregon and Washington, D.C., Peru, Italy and Greece. I’m trying to make the world a bigger place for people with autism. 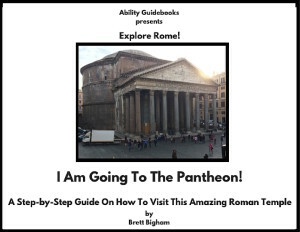 I think it is working!Ability Guidebook_ I Am Going To The Pantheon! 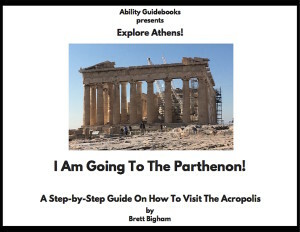 Author Brett BighamPosted on April 27, 2016 November 17, 2017 Categories Ability GuidebookTags Ability Guidebook, autism, autismo, brett bigham, italy, oregon, pantheon, rome, teacher of the yearLeave a comment on “I Am Going To The Pantheon!” A new Ability Guidebook for peeps with autism. Hello! I am very excited to announce that I have finished another Ability Guidebook! These “guidebooks” are basic instructions on how to visit community destinations and events. I began writing these books to assist my own students with autism in attending field trips but I realized that I could be doing so much more. In 2015 I had the amazing honor of being named an National Education Association Foundation Global Fellow. Through this program I was sent to Peru as an ambassador for American educators. I’m the first special education teacher from Oregon to be named a Global Fellow and the trip to Peru gave me a chance to do what I do best: support people with special needs. From that trip came my first international Ability Guidebook “I’m Going to the Museo de Inka!” I’m absolutely grateful to the NEA Foundation for giving me the opportunity to share this project with another country. In 2015 I also had the joy of going on my honeymoon and from that trip will come the next round of international guidebooks. I have realized that I can make books whenever I visit a new city. I can show the teachers and Autism Specialists around the world of a new and better way to support our students. If our students aren’t out participating in the real world then we haven’t succeeded in our jobs. I want to make sure that I have done everything I can to help. I am thrilled to say the first honeymoon book is finished! I know that a book like this would have helped my own students visit the Acropolis and I hope it will help other people as well. I am also hoping to find people to translate books into their native languages. If you can translate this into Greek or any other language, get in touch! 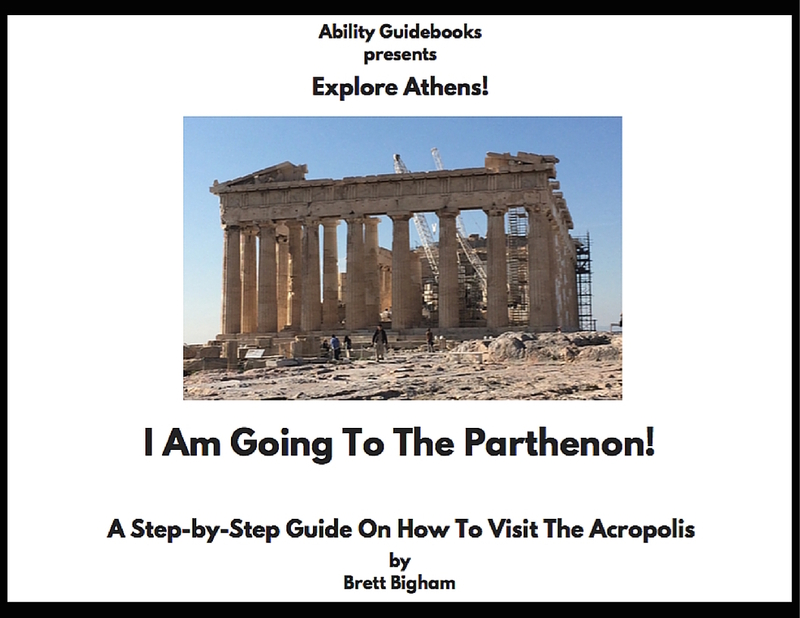 Ability Guidebook_ I Am Going To The Parthenon! People with autism often have difficulty facing new situations. That is why I teamed up with the Port of Portland to create “Let’s Fly, A Photo Guidebook Tour Through Portland International Airport.” It is a step-by-step guide on what to expect when you use the Portland Airport. I want my students to have a bigger world. Supports like these can make that happen.